Nolan Wirth in action for Canada’s U-20s. (Canada Soccer). 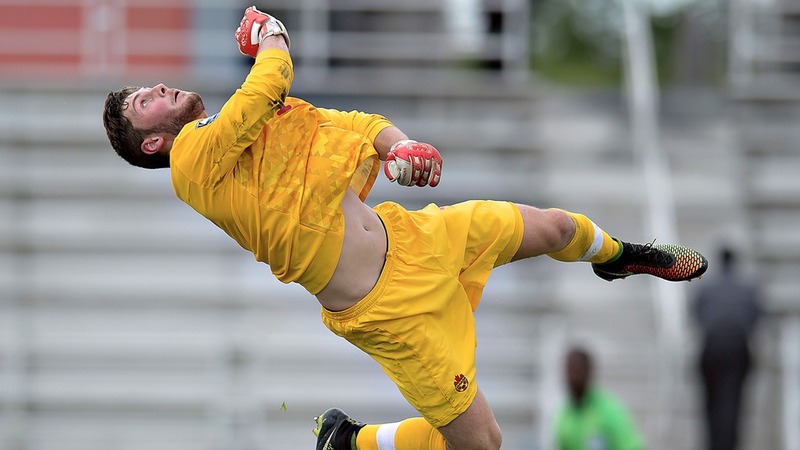 Pacific FC announced Tuesday the club has signed Vancouver Island-based goalkeeper Nolan Wirth, with the Comox-raised goalkeeper bringing experience playing for Canada’s Under-20 team and the Phoenix Rising FC in the USL. Wirth becomes the first true Islander to sign with the Vancouver Island-based club. At 6-foot-1, Wirth stands tall in net and has been a force in Vancouver Island’s soccer scene since the age of 12, when he played at the top levels that the Island has to offer. The 24-year-old shot-stopper played at the metro level in his teenage years and was named Most Valuable Player with Upper Island Soccer Association (UISA) in the 2010-2011 season. Wirth joined Whitecaps FC Residency and represented B.C. at the Canadian Under-16 All-Star Championship. At 17, he made his debut in the Canadian youth program for the Under-18 team and competed for the Under-20’s at the CONCACAF qualifier in Jamaica as a 19-year-old. Wirth played NCAA Division 1 soccer for Oregon State University and later joined Didier Drogba’s Phoenix Rising in the USL for the 2017 season. He returned to Vancouver Island in 2018 to play with Highlanders FC of USL League 2 before competing in the VISL. Wirth joins 11 players who have been named to Pacific FC’s roster, including Marcel de Jong, Marcus Haber, Kadin Chung, Mark Village, Ben Fisk, Victor Blasco, Jose Hernandez, Matthew Baldisimo, Terran Campbell, Noah Verhoeven and Alessandro Hojabrpour. Pacific FC kicks off its inaugural season in April at Westhills Stadium.